I don't know about you, but I just love a styled classroom! You know the classroom I'm talking about, right? It's the kind of classroom that seems to have it all pulled together. Sometimes in our quest to have a visually appealing classroom, it can hard to know where to begin. That's why I've put together a set of Classroom Design Mood Boards to provide a little inspiration. Speaking of inspiration, all of the mood boards in this post are based on a color of the rainbow. Why? Because one of the easiest ways to put together a styled classroom is by sticking with a single color. This makes gathering design elements for the room super easy. For instance, if you're going for a "blue" theme, then picking out storage containers, a lamp, a poster, and even a fun seat are easy, because all you have to do is make sure that they're blue! Storage baskets - What's a classroom without storage, right? Well, if you're thinking of getting storage containers, I've included a few inspiration pieces on each design board. The items that I've placed on the mood boards are selected with a teacher's budget in mind. That means that I really tried my best to ensure that no single item was more than $50. Oh, and since they're sourced from Amazon, there's a chance that you'll be able to put some of the elements on a school purchase order, or perhaps you can put your design requests out into the world with programs like Donors Choose. Of course, the mood boards are mainly intended for inspiration. However, if you do want to learn more about each of the items, just click the links provided. OK...enough background information, let's get to the Classroom Mood Boards! Check out the 7 colors-of-the-rainbow inspired mood boards! 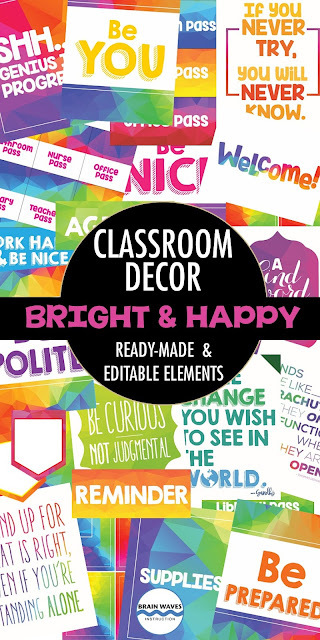 And...if you'd like to instantly decorate your classroom, check out this Bright and Happy Classroom Decor Pack! It's filled with over 200 pages of ready-made decorations and includes 25 pages of editable decor elements! Since it's filled with every color of the rainbow, you can display the classroom decorations with any color theme! Great News! I've been working with my friend Rachael from The Classroom Nook and we have a TON more classroom decor and design ideas for teachers! In fact, we've put together a 30-Day "Get Your Year in Gear" teacher-challenge. It's absolutely FREE! Just click here to learn more. When you sign up, you'll get access to 4 mini-courses that cover everything Back to School including classroom design, organization, curriculum planning, and ways to build a positive classroom community. There's also a TON of exclusive freebies, bonuses, and videos! Oh, and as if it couldn't get any better, there's even a lively Facebook group of like-minded teachers! If you'd like to learn more and sign up, just click HERE.